Summary: Noemi Vidal has returned to her planet, Genesis, as an outsider - ostracised for refusing to end the Liberty War by sacrificing Abel, the most advanced mechanical man ever made. She dreams of travelling through the stars again, and when a deadly plague arrives on Genesis, Noemi gets her chance. The only soldier to have ever left her planet, it will be up to her to save its people. If only she wasn't flying right into a trap. Abel, now fully aware of his soul and captaining his own Vagabond ship, never dreamed he'd see Noemi again, not when the entire universe stands between them. But when his creator Burton Mansfield delivers news of Noemi's entrapment, Abel knows he must save her, even if it means risking his own life. Danger lurks in the dark corners of the galaxy, and Abel and Noemi will discover a secret that could save Genesis and Earth... or destroy them all. 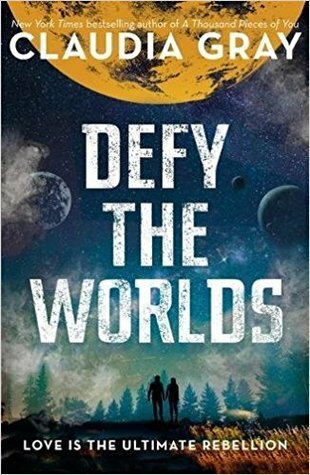 I feel like the first book in this planned trilogy, Defy the Stars, is so under-rated. If you didn't like Gray's Evernight series don't let that put you off these books. They are diverse, action packed reads with root worthy characters. I'm going to be honest and admit that it took me a second to get back into the world. The reason why is because I wasn't expecting the two main characters, Abel and Noemi, to be spending the first half of the book apart. What made book one so interesting was Noemi and Abel's adventure together. However, I was determined not to DNF it because I loved book one so much, and in the end I'm so glad I did. My initial struggle to get back into the world didn't last too long, after about 5% Noemi and Abel's separate story arcs took off. I got sucked right back in, and was eagerly waiting for them to reunite. As with the first book there's diversity, religion, and philosophical pondering which I enjoyed. The relationship between Abel and Noemi is literally the definition of a slow burn romance. There's no rush to say the L world, instead Gray's takes time exploring their feelings for one another. I always prefer when there's a build up of tension, and hints of thing to come in book one of a series. Then in book two you see it come to fruition like yesss! The ending was shocking! I didn't see it coming and it makes me wonder what direction the conclusion will take. I really enjoyed the first book too. And you're right, I don't hear enough about this series. I have yet to grab up this sequel though and perhaps I can do so this summer. Thanks for the heads up to hang in there in the beginning and I'm excited to discover this ending you mentioned! Great review Renu :D And yay for enjoying this book so much. Yay for good slow romance. <3 And for an exciting ending, haha :) I hope you like the next book a bunch.